In emerging regions, where healthcare infrastructure is limited, there is an urgent need for greater access to reliable diagnostic testing, particularly for infectious diseases. CellScope’s objective is to establish mobile digital microscopy as a platform for disease diagnosis that can be used by non-expert health workers to in remote settings. The mobile phone-based, easy-to-use device can rapidly capture images blood, sputum, or other patient samples and wirelessly transmit the data to clinical centers, allowing the patient to be evaluated remotely and treatment suggested at the point of care. By using existing communication infrastructure, CellScope moves a major step forward in affordably and innovatively taking clinical microscopy out of specialized laboratories and into field settings for disease screening and diagnoses. Specific applications of the CellScope platform are developed in collaboration with local disease experts and technology companies. Integrated with complete disease workflows, the CellScope team has also worked with commercial partners to build corresponding business models and metrics for evaluating impact. Taking this interdisciplinary approach is essential to transition from CellScope’s initial proof-of-concept technologies to fielding a platform that provides a sustained and measurable change in healthcare delivery. The CellScope approach uses a combination of mobile phone microscopy and on-phone image processing to detect movement of Loa loa mf in unstained whole blood imaged in a disposable glass capillary. With further development, this method of screening will allow for an immediate Mass Drug Administration (MDA) treatment decision for a given individual at the point of care without the need for the patient (or MDA team) to return at a later time. Since 2012, the CellScope team has carried out multiple design and test iterations and last year validated device performance in a 300-person study with collaborators at the University of Yaounde in Cameroon. In fall of 2015, the device was used to screen and treat 17,000 people around Yaounde, Cameroon, where it successfully enabled treatment for onchocerciasis with no serious adverse events that had halted mass drug administration in the region. The team is planning for a second large field trial in the fall of 2016 that will double the number of people treated to build further confidence in the technology. 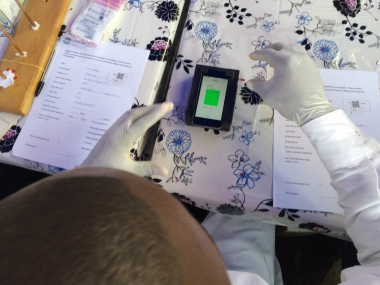 “Point-of-care Quantification Of Blood-borne Filarial Parasites With A Mobile Phone Microscope” by Michael V. D’ambrosio, Matthew Bakalar, Sasisekhar Bennuru, Clay Reber, Arunan Skandarajah, Lina Nilsson, Neil Switz, Joseph Kamgno, Sébastien Pion, Michel Boussinesq, Thomas B. Nutman, Daniel A. Fletcher, Science Translational Medicine, May 2015.